So many of you have asked recently for this recipe after seeing photos that I posted… I made this fabulous sauce the other day for my mother’s birthday as both a gift and for the dessert! Several weeks ago she was commenting on how she wished that she could find this sauce in the stores for ice cream sundaes, but never could. So… I decided to try my hand at making some! Not sure if it measured up to or exceeded her favorite Friendly’s Peanut Butter Sauce standards or not, but everyone seemed to really enjoy this! – Combine all ingredients (except the peanut butter) in a saucepan, stirring constantly until all ingredients are dissolved. – Let the mixture cool completely (personally, I took it off the heat and let cool, but still warm), then add the peanut butter and stir well. – It will look messy, but keep stirring and it will turn out smooth and still have some of the grainy texture of the peanut butter! Time to enjoy! For my mom’s birthday, I acually made a double-batch thinking we would needs lots, but the single-batch would have served 6-12 people, with some left over. This would be best kept refrigerated (due to the dairy), but is great warmed up for about 30 seconds (depending on the serving size), and is perfect for ice cream sundaes, or perhaps even to drizzle over a rich chocolate cupcake. 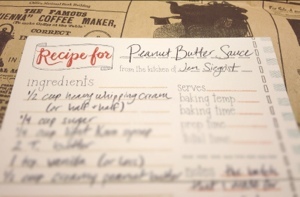 I’m sure that there are lots of other ways that this delicious sauce could be used… I would love to hear some more ideas or ways that you use the peanut butter sauce when you make it!